Michael Hendrix labeled his stone "Bloodstone" but the colors more closely resemble what is usually termed "Fancy Jasper." It is a silly quibble because both are names for the same stone as is "Heliotrope" as well. We discussed why a normally green stone with red spots would be labeled "Heliotrope" here and another distinction that's occasionally made in the naming here. Note I've added a new book (Chameleo) about invisibility cloaks to the references below that was published after I wrote the aforementioned page quoting Pliny disparaging such foolishness. The book is a wild ride, it mostly took place right here in San Diego -- I well remember the tank incident -- and is apparently not fictional. But let's get back to the stone in this bracelet. We think of Fancy Jasper as coming from India like the examples Ron Gibbs shows in Agates and Jaspers, but I found a photo in Agates III of what Zenz calls "Bloodstone" from Northern Bohemia whose colors look very similar to this stone. He says the locale supplied excellent jasper to the famous Czech stone-cutting industry for centuries. "Most frequently found was a kind of heliotrope with a blue-green base material." Sounds exactly like our stone! Melody says its message is "be here now." 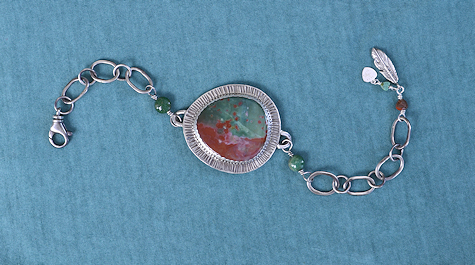 The stone colors are exceptionally beautiful and my somewhat quirky handmade chain is both strong and lovable. Please order it today and enjoy wearing it!